This is a summary for Brinley’s 50th week; she was 49 weeks old. She still nursed for the first two feedings this week. No biting. A fun thing about her taking bottles now is that the family can get involved. Kaitlyn absolutely loves to feed Brinley bottles. She cuddles up with her on the couch and feeds her. She gives her kisses. It is so cute to watch. This week, she started to refuse purees with me at times, also. I need to put my thinking cap on and remember different ways to feed vegetables! Sleep was great and normal. She was super happy again this week. Oh how I love the super happy weeks! She continued getting more and more mobile. 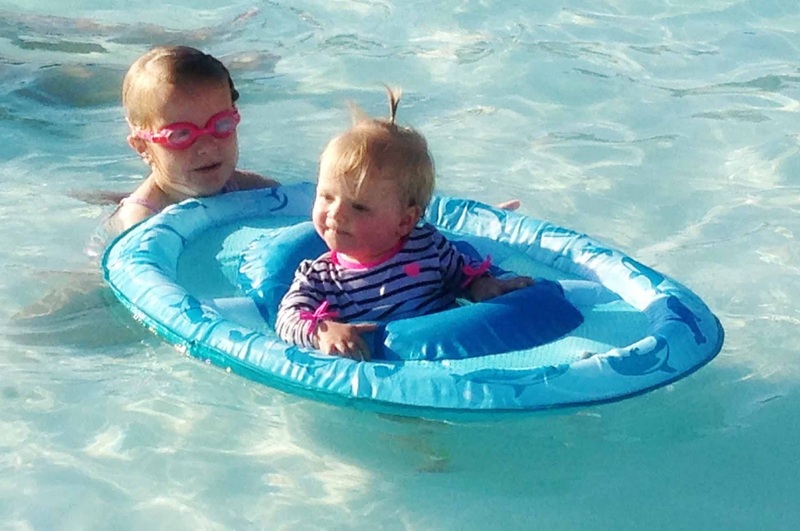 Brinley went swimming again this week. She loved it! She loved it so much. We got out our floatie from swimways (Baby Spring Float). She loved sitting in that and going out into the water. It made swimming with her TONS easier, and the kids loved pushing her around in it. We have a hall that leads to our stairs. Brinley is not allowed down that hall because I don’t want her falling down the stairs. She will test her limits. Sometimes she listens to me and turns around. Sometimes she smiles and waves and me and continues down the hall. My mom was here one day when Brinley went into the hall and I called her back. My mom commented that “oh! She isn’t allowed down there!” She shared that when she was watching Brinley, she would get to the opening to the hall, get a “glint” in her eye, wave, and take off down the hall. Always testing. 7:30–bottle, then bedtime. In bed by 8:00-8:30. From a mom with a baby girl who refused baby food at 8 months, there are really a lot of veggies that you can just throw on the tray! I'm sure you know this, but maybe it will be helpful!! Green beans, peas, corn, sweet potatoes cut into squares, white potatoes, lima beans, carrots(though my daughter refuses them)….of course all these are cooked. For fruit she loves blueberries.. also cut up grapes, strawberries, watermelon, pineapple. I also give her noodles from certain dishes. And, she loves some bread. Any kind of bread. I have even made her grilled cheese and torn it up for her. She also loves a cut up corn dog. Super loves. Not the healthiest, so you may not like that idea. I've been doing this for over 3 months now!!! On a side note, what plans do you have for Brinley's first birthday? It must be like a week away. I was thinking of doing a Minnie Mouse party for Annalise. I was just curious! Thanks! Renee, At this age, I mostly redirect or use substation/distraction. So I say, "Brinley, come back. You may not go in the hall." She knows exactly what I mean. When she comes back, I praise her like crazy. When she doesn't, I get her and tell her, "That's a no; you need to obey Mama. You may not go down the hall. You may XYZ." Repeat as necessary 🙂 But if she is being insistent on going down the hall, I will put her somewhere where she can't get to the hall. Stephanie,Thanks for the ideas! I have obviously fed three kids like that before, but it is like I need a refresher course. I think I need to sit down and actually make a list of things to give myself ideas.Birthday–I am not the most exciting for birthday parties of young ones. I don't do a theme for a one year old. I make a cake, buy balloons, wrap presents, make a big dinner full of their favorites, and that is it! So I don't have a theme planned.